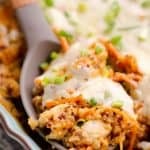 Buffalo Chicken Quinoa Bake is a healthy and easy weeknight casserole recipe full of fresh vegetables, lean chicken breasts and quinoa in a cheesy buffalo sauce. 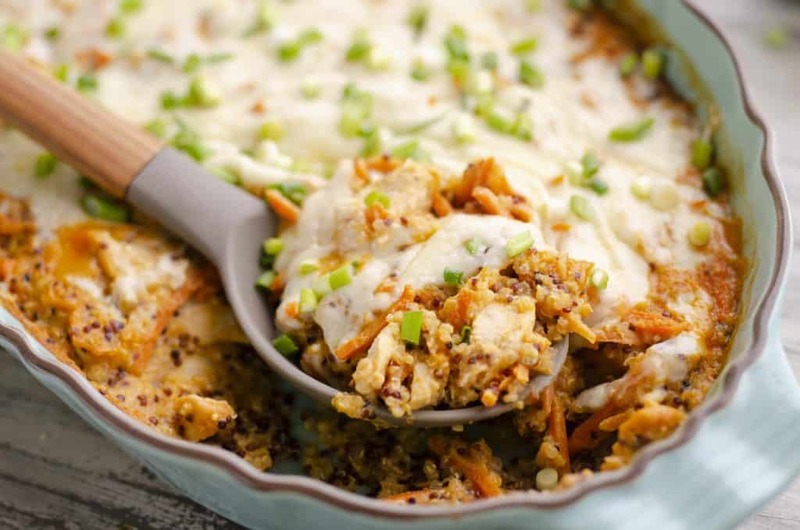 Quinoa bakes are one of my favorite weeknight dinners. 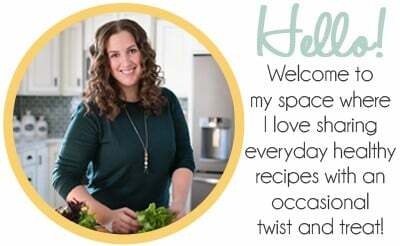 They are packed with flavor and lots of healthy ingredients, but best of all it is so easy to make. Bring some quinoa to a boil in chicken broth and dump it in the casserole with everything else and throw it in the oven. There is no need to pre-cook the chicken or vegetables, because they will all cook through while baking. 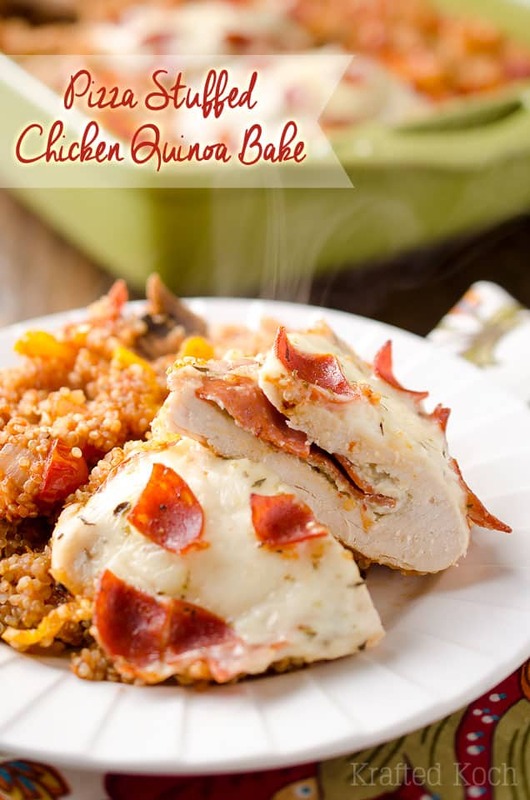 This Light Aspsaragus Chicken Quinoa Bake is what started my love for quinoa bakes in the first place and my readers have loved it just as much pinning it almost 200,000 times! I snuck some carrots inside the casserole so we can get our veggies in. Most people are trying to hide vegetables in recipes for their kids, but I am over here trying to hid them from myself. Ugh… I know I need to eat more but I am just not a fan of straight veggies. When they are mixed in with lots of other flavors and textures I can get on board. 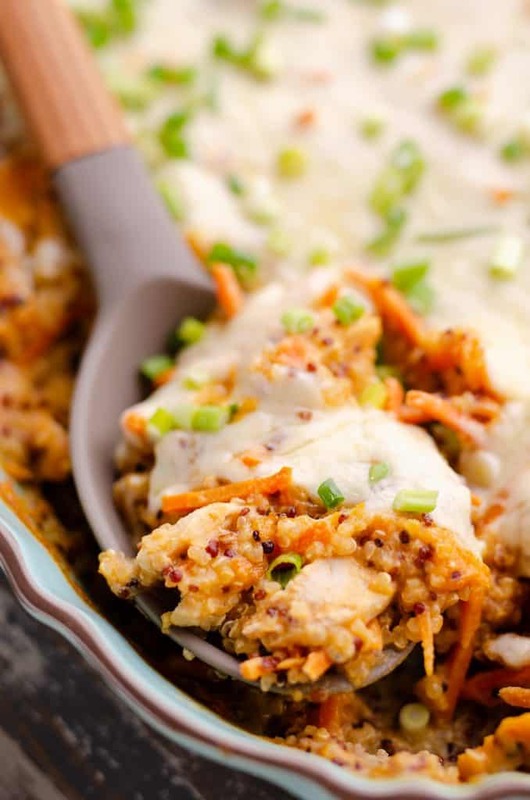 If you are a huge vegetable fan you could even sneak some more celery, mushrooms, broccoli or other vegetables in this Buffalo Chicken Quinoa Bake. Just be sure not to add too many or it won’t set up with the right consistency. In a medium saucepan over high heat, add the flour and slowly whisk in the chicken broth until smooth. Add the quinoa to the broth and bring to a boil. 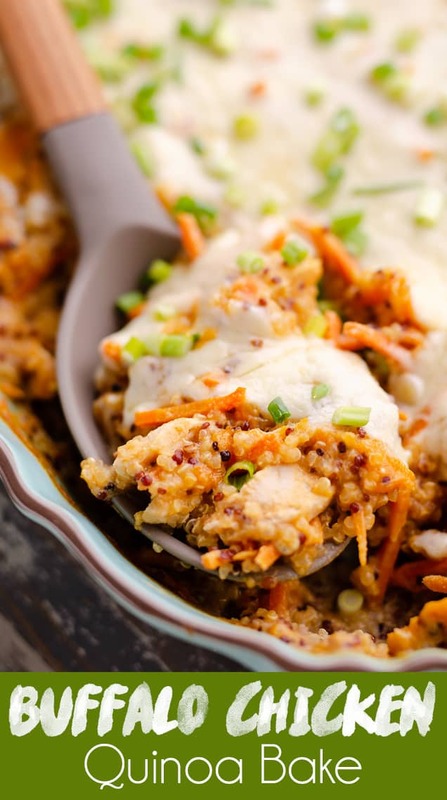 Add the quinoa to your sprayed casserole along with the carrots, buffalo sauce, bleu cheese, salt and raw chicken. Gently fold everything together bake covered for 30 minutes. Remove the pan from the oven and carefully give the hot dish a stir. Top with the shredded white cheddar or Havarti and bake uncovered for an additional 15 minutes. Serve the casserole topped with green onions. 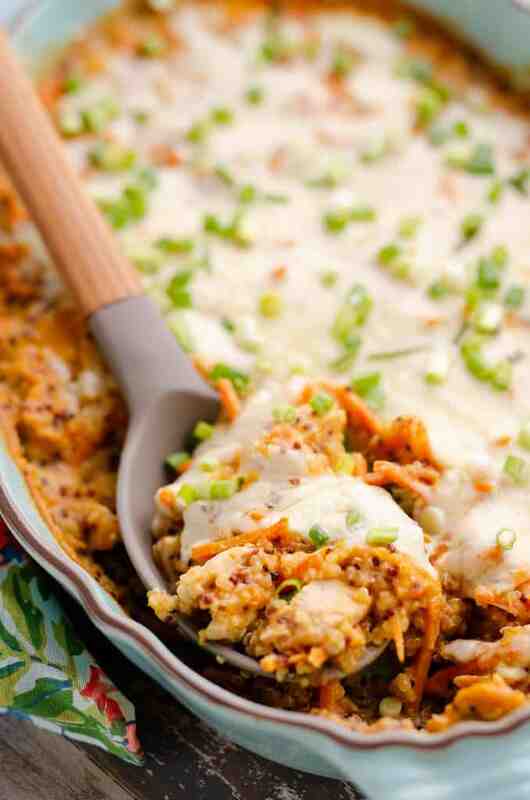 If you like a really creamy dish, a dollop of non-fat plain Greek yogurt would be another great addition to the Buffalo Chicken Quinoa Bake to cut through the spice of the buffalo sauce. In a medium saucepan over high heat, add the flour and slowly whisk in the chicken broth until smooth. Add the quinoa to the broth and bring to a boil. Spray a 9x13 casserole with non-stick spray and add the quinoa along with the carrots, buffalo sauce, bleu cheese, salt and raw chicken. Gently fold everything together bake covered for 30 minutes at 375°. Remove the casserole from the oven and carefully give everything a quick stir. Top with shredded cheese and bake uncovered for an additional 15 minutes. Serve topped with green onions and/or non-fat plain Greek yogurt. 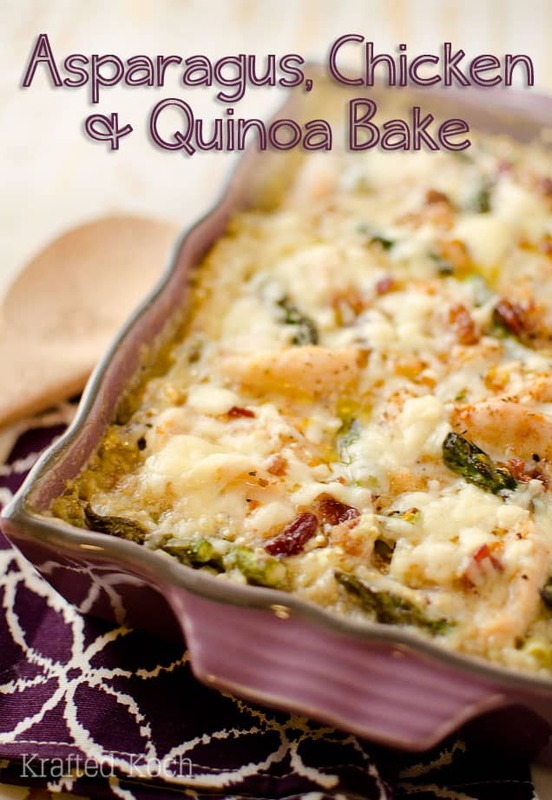 More healthy quinoa casserole recipes! 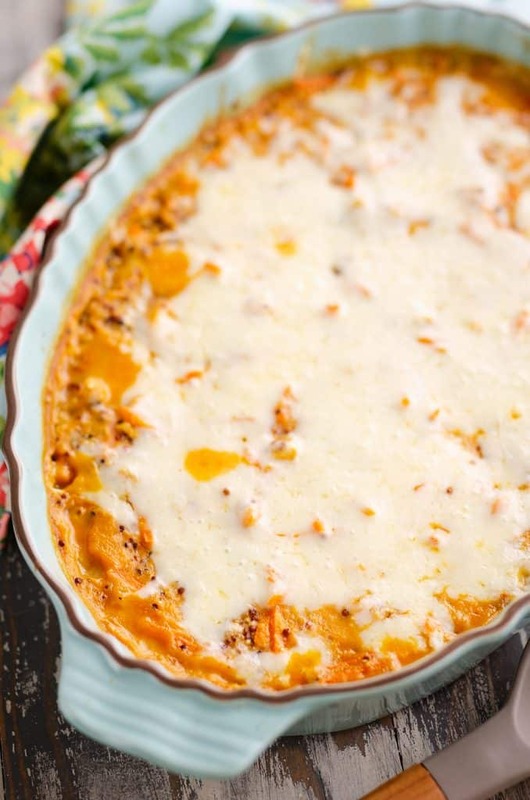 This is a comforting casserole for all those buffalo chicken fans!! LOL. Trying to hide vegetables from yourself! Well, this is the perfect way to do it! This dish had a delightful kick to it that knocked it out of the park! Will be making again! 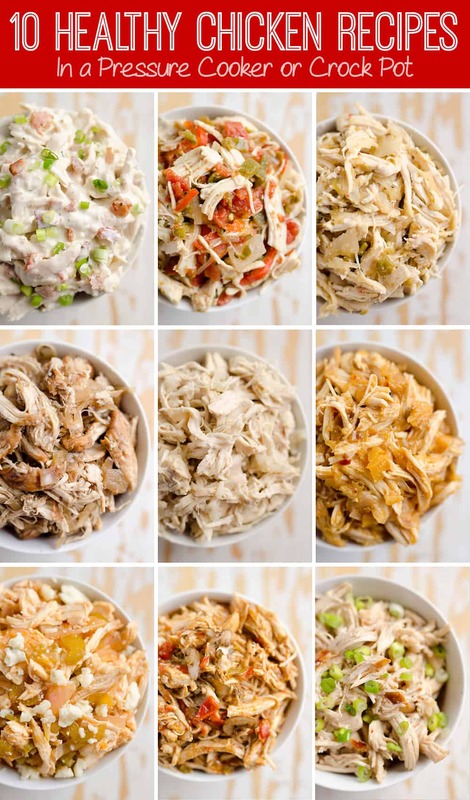 Big buffalo chicken fans here! Loved this healthy dish with our favorite flavors!